It was all about having the Flow. Having the Flow was being half dead, passing through the lattice of the streets and traffic at an oblique angle, meshing with the City like the chain on the rear cog, never resting, never coasting, never changing gears. Having the Flow was like being a Scooby Doo ghost, drifting through physical walls, untouchable by mortals. Having the Flow was dope, three times. But Clive did not have the Flow. EGGMAN vividly portrays the amazing diversity a messenger deals with daily and how the messenger can go places that no other citizen can. Like The Crying of Lot 49, EGGMAN delves into a mysterious city beneath the city. A second, undercover reality full of secret signals and satires of pop and corporate culture. Also, milkshake erotica. That part wasn't in Pynchon's book, so that's a bonus if you're in to that kind of thing. J Milligan sees things that other people don't. EGGMAN is a noirish whirlwind of hilarity and surprise; it's a very fun ride. Set in the bicycle delivery world of NYC post-9/11, EGGMAN is itself like a bike messenger: fleet, fierce, always racing towards a sure destination even when you can't predict its unexpected swerves, slips or turns - a tough machine powered by flesh and blood, zooming through the wreckage of a still-tender city. In the end, J Milligan does what every good bike messenger must: he really, truly delivers. 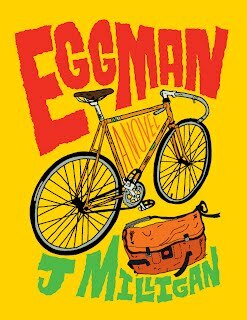 Upon reading EGGMAN, I found myself convinced that J Milligan has earned his spot among that small pack of writers successful in their efforts to convey the twisted state of affairs that is our young century. The strangeness that Milligan lays before us is not, however, an arbitrary splattering of paint--there is a remarkable control behind this mad, pre-apocalyptic narrative and a gift for language that punches exactly when it needs to. If at times I was reminded of Sam Lipsyte's bleak but exacting humor, at others I felt the romance that gets me in Murakami's best work. But, without question, Milligan's voice is all his own . . .and it deserves the widest possible audience, among which I will sit any time.